When you have a sweet tooth that is as big as mine, there are some days when you feel that you have to cut back. Some days when you feel like you have to lay off the butter, sugar and eggs for a while, and go for something more natural. 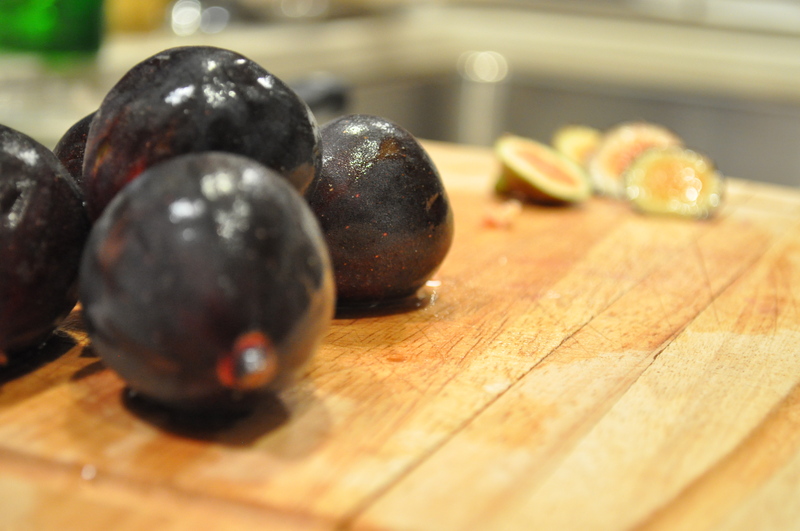 So when I saw that figs are well in season and are abundantly being sold in grocery stores and farmers markets, I was more than satisfied to forgo my weekly dessert option and have figs as my post dinner sweet ending. Sounds like a stellar plan, right? Well, it was. 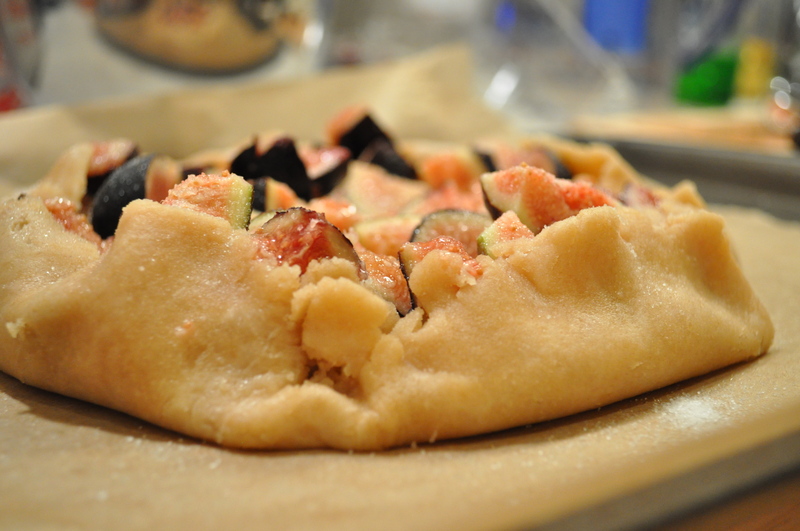 Until I found a recipe for a fig galette. I mean, you really can’t blame me. Figs dressed in a simple sprinkling of sugar tucked into an all-butter pastry crust coated with apricot jam! Or…figs. Just by themselves. Who are we kidding – there wasn’t much of a choice. At all. The guilt did set in a little bit, though, so I decided to use a whole wheat, oil based crust instead of more traditional butter version. Which surprisingly turned out to be quite flaky and delicious. And the rest of it is basically just fruit! ..And sugar and jam. But who’s counting. This recipe was a tad too sweet for me. I remedied this by sprinkling a bit of sea salt on top of the entire galette after it baked. But I included mixing it in to the filling in the directions. Whisk together all of the dry ingredients. Mix in the wet ingredients until dough forms. Roll into a disk, wrap in plastic wrap and chill in fridge for at least 30 minutes. Take out and roll into a 12 inch diameter circle and place onto a parchment paper-lined baking sheet. Place into freezer while making filling. Preheat oven to 375. Stir together figs, salt and 1 tbsp. of sugar. Spread the jam onto the chilled pastry, leaving a 2 inch border. 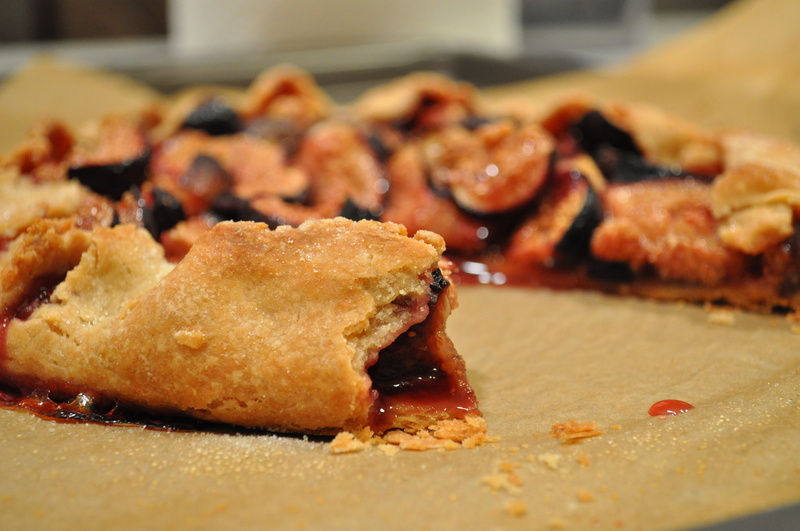 Arrange the fig filling on the crust, directly on to the jam. Sprinkle with remaining tbsp. of sugar. Fold over the 2 inch border of dough over filling, pleating as you fold to ensure the filling won’t escape. Bake for about 45-50 minutes until golden brown. Let cool for about 20 minutes and serve warm or at room temperature. Yogurt. I love everything about it. Frozen, fresh, vanilla, plain, fruit on the bottom, soft serve, the kind that looks like ice cream, fat free, full fat, cream top (oh! the cream top! ), it’s all the best in my book. So when there was a slight grocery shopping communication issue, and we ended up with four full size cartons of yogurt in our fridge, I was not upset. In fact, I was thrilled. 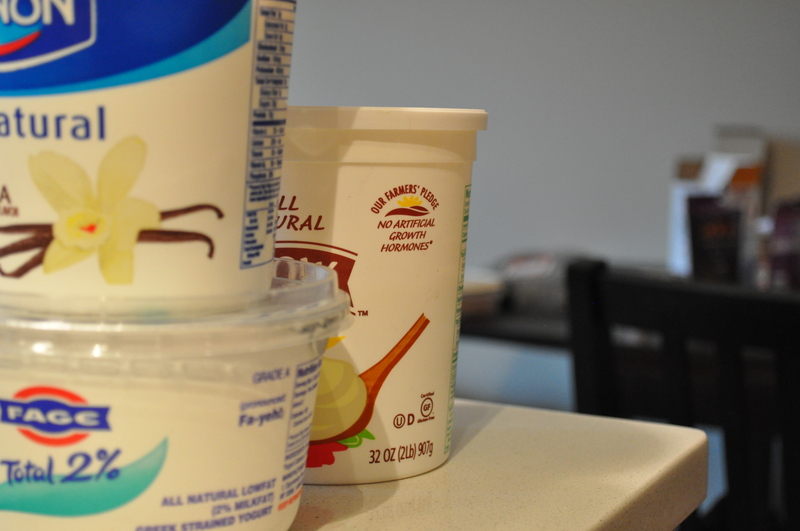 This not only made it easier to up my daily servings of yogurt to three, but also gave me a chance to play around with incorporating yogurt into my baked goods. Specifically, a tart. Not a pie. Too late for berry pies but too early for apple and pumpkin, September happens to be a pie-less month. But a tart! 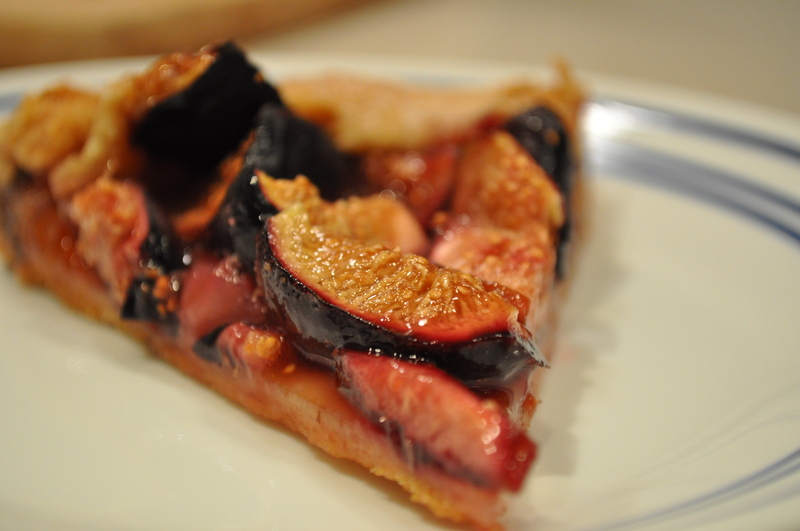 A tart is the best of all dessert worlds and is, by far, the best lead-in to the upcoming pie-heavy season. I found the perfect recipe, and with some tweaking with the ingredients I had on hand, I had a winner. 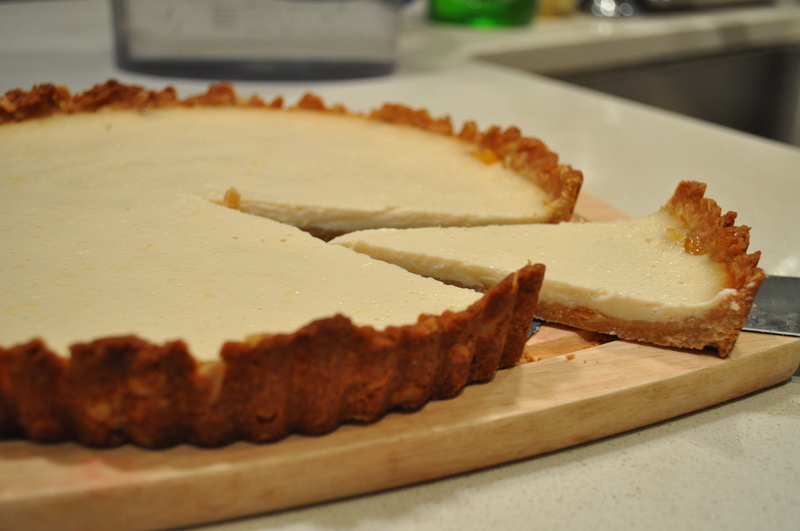 A cheesecake-like dessert with the sweet tang of lemon and ginger scented yogurt all wonderfully tucked in a buttery crust. And because yogurt is available all year-round, it’s great at any time! Who wouldn’t want that? This tart is like a cheesecake. But keep in mind, a very thin cheesecake. But because of this similar consistency, I would support, in fact, encourage, a graham cracker crust. Or maybe even crushing up some gingersnaps! Think about it. Preheat oven to 350F degrees, rack in the middle. In a medium bowl combine the flour, oats, and salt. In a medium saucepan melt the butter over medium heat. Stir in the agave nectar and sugar. Now add the flour and oat mixture to the butter and stir well. Cook a couple minutes – just until you get a bit of a toasted smell. 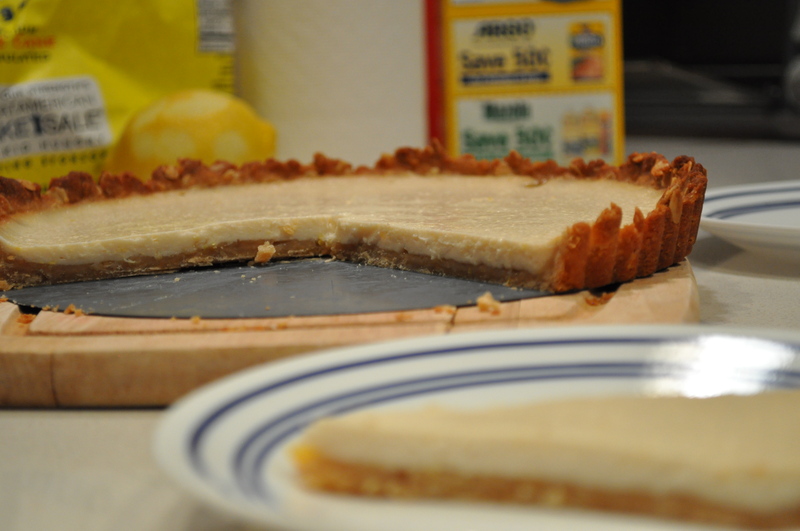 Press the mixture into (and up the sides) of the tart pan using your fingers and/or the base of a glass. Freeze until completely cooled – 5 or 10 minutes. In the meantime, to make the filling, combine the yogurt, agave nectar, lemon zest and ginger juice in a medium mixing bowl. Taste. Stir in the cornstarch until well incorporated. Spread the orange marmalade onto the prepared crust. Fill the tart shell with the yogurt mixture. Bake for about 35-40 minutes. The filling should be set, and no longer jiggly. Remove the tart and let cool for ten minutes. Refrigerate for a couple hours. Serve topped with chopped crystallized ginger, fresh fruit, or dried fruit. Or a fruit sauce. Or a warmed up lemon curd. Which, I suppose is essentially a fruit sauce. But really, you have many possibilities. Like in most things, there are certain aspects of baking that I could do without. Converting a recipe from grams to ounces to cups, for one. Or sifting the dry ingredients, which always leads to taking out and cleaning one more utensil. But who really wants a dense, hard to swallow cake? So I learned to do that one. But the thing that I’m most lazy about is greasing a pan. I would rather spend my time hoping and praying that my baked good will come cleanly out of the vessel in which that it was baked, than actually taking the time to butter and flour the pan. It seems so simple, but I can never convince myself to do this part well. Why all this insight into my baking bad habits, you may wonder. Well, this was one bad habit I had to break. It was reactionary, so please do not think that I just happened to see what was best for my products, and those that ate them. I’m not that noble. 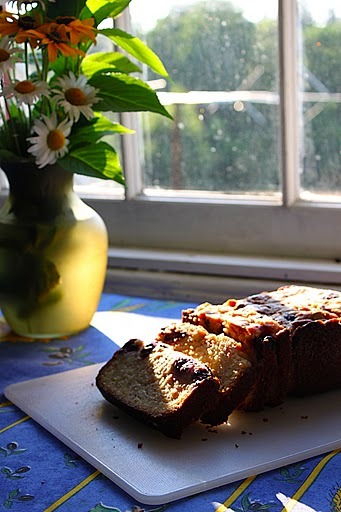 I wanted to make a quick bread as a gift, and thought that the extra step of greasing AND flouring the pan AND lining the pan with parchment paper AND greasing it again, seemed unnecessary. So I quickly sprayed the loaf pan with my handy no stick spray and was set. Set. Ooooh boy, was that loaf ever set. The loaf was so extremely stuck to its pan that I had to knife it out. And then cut the burned edges. And then cut it again so it didn’t look like I purposely cut the burnt edges. But the result, minus the crispy parts in my trash can, was divine. 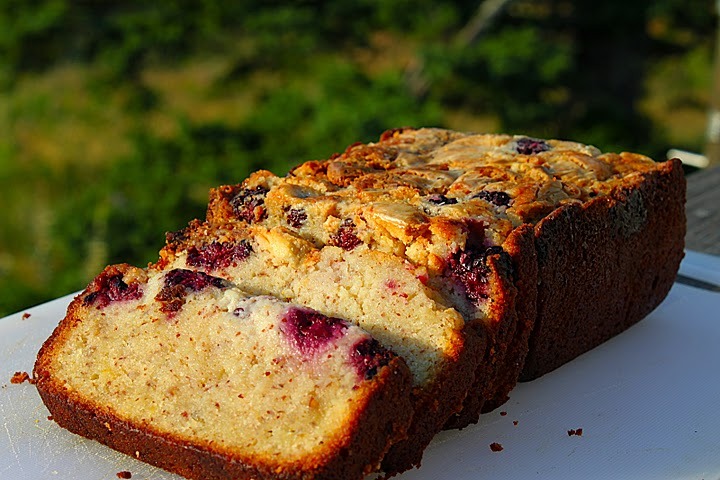 Almonds and lemon and blackberries, and white chocolate – you may first think that there is way too much going on, but no. Think again. It was just perfect. All blended together in this amazing merriment. And though it was delicious in its own right, I wish I had the whole loaf. Including the crust. Grease the pan. That’s all I’m sayin. Preheat oven to 350°. Butter and flour a loaf pan. Line the bottom with parchment paper. Butter pan and set aside. Beat butter and sugar until light and fluffy. Add eggs, a little at a time, until blended. Stir in flour, ground almonds, and lemon zest and juice. Stir in both extracts. Coconut cake with coconut extract. Filled with coconut custard with coconut rum. Drizzled with coconut syrup with shredded coconut. All with…chocolate frosting. My sister’s birthday just passed, and just like every other year, she got to pick the cake she wants me to make for her big day. There were several years of requesting boxed yellow cake mix with the chocolate frosting in the tub, another year when I went in a different direction and made orange cake with cream cheese frosting (the chocolate lover in her did not appreciate that one), one year with a caramel cake with chocolate frosting that ended up on the floor by mistake, and last year’s chocolate cake with raspberry filling. This year, she took a chance with coconut. Despite the lack of coconut in the frosting (though I doused it with coconut on the frosting), this cake was coconut heaven. 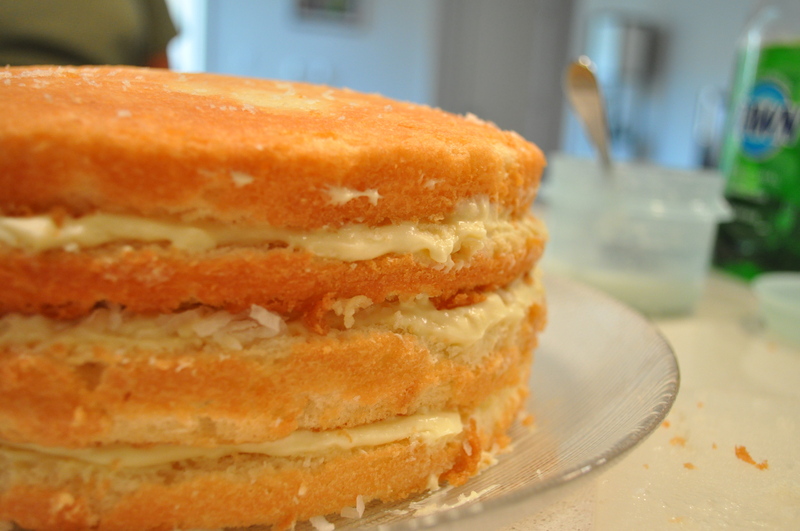 It seems that so many coconut cakes are just a white cake with coconut sprinkled on top. That is certainly not enough coconut flavor for me. 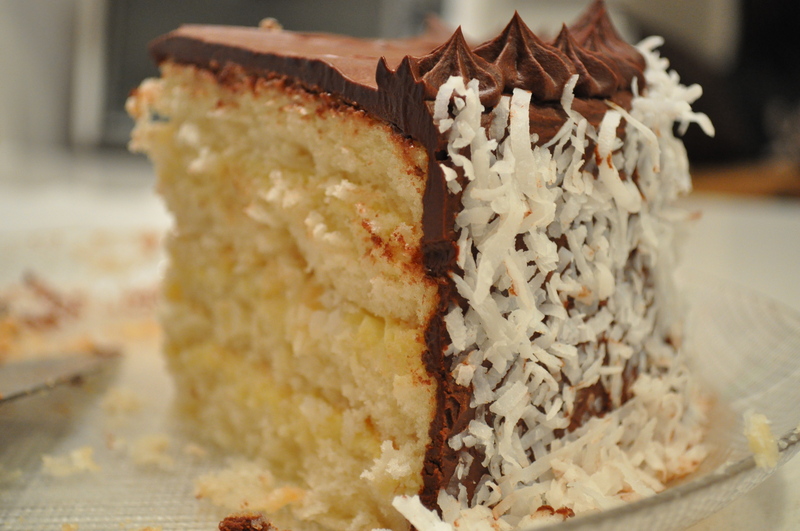 Not only is every part of this cake flavored with coconut, the key is in the custard. Oh my goodness, the custard. Make it. Eat a bowl of it. You’ll see. And then make it again and fill the cake with it. 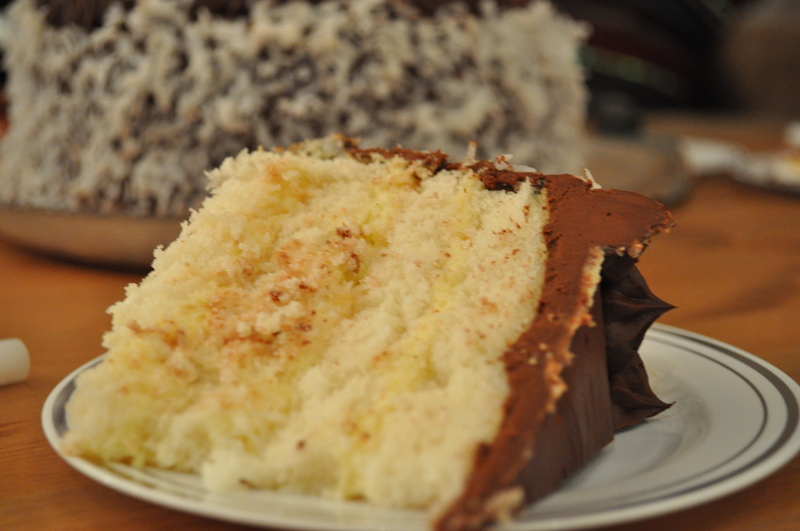 The end result is so light and barely sweet that the coconut flavor shines through. Beyond delicious. 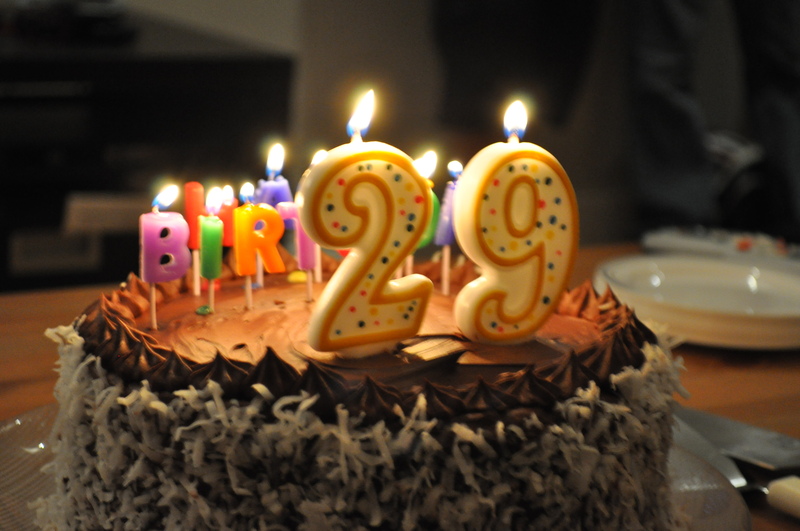 This cake takes quite a bit of time. But seriously worth every minute! Mostly because it tastes better after it sits for a while – gives time for the coconut custard and coconut syrup to seep through the cake for a bit. I made the cake, filling and the syrup the day before. And made the frosting did the assembling the day of. Combine the custard and cream in a bowl and whip until soft peaks form. Refrigerate until ready to use. Preheat oven to 350 degrees F. Butter and flour 2 (9 by 2-inch) round cake pans and line bottoms with parchment paper. Butter the parchment paper. Whisk together the coconut milk, egg whites, vanilla extract and coconut extract in a medium bowl. In the bowl of a mixer fitted with the paddle attachment, mix together the flour, sugar, baking powder and salt. With mixer running at low speed, add the butter, one piece at a time and continue beating until mixture resembles moist crumbs. Add all but 1/2 cup of milk mixture to crumbs and beat at medium speed until the mixture is pale and fluffy, about 1 1/2 minutes. With mixer on low speed, add remaining 1/2 cup of the milk mixture, increase speed to medium and beat 30 seconds more. Scrape sides of bowl and mix for 20 seconds longer. Mix in the dessicated coconut. Divide the batter evenly between the cakes pan and smooth the tops using a rubber spatula. Finely chop chocolate. In a 1 1/2- to 2-quart saucepan bring 1 cup of cream, sugar, and corn syrup to a boil over moderately low heat, whisking until sugar is dissolved. Remove pan from heat and add chocolate, whisking until chocolate is melted. Cut butter into pieces and add to frosting, whisking until smooth. Add rest of the cream. 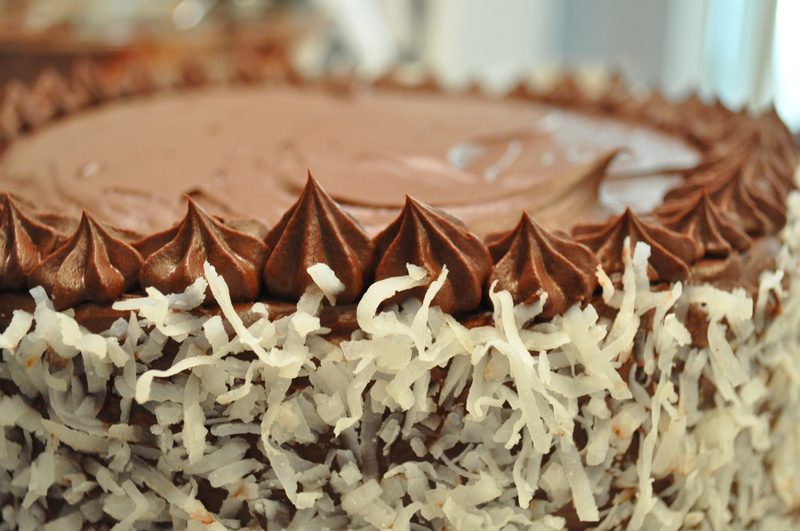 Using an electric mixer, whip until frosting-like consistency is achieved. Frost the sides and top of the cake with the chocolate frosting.